Genus: Vanilla Plum. ex Mill. 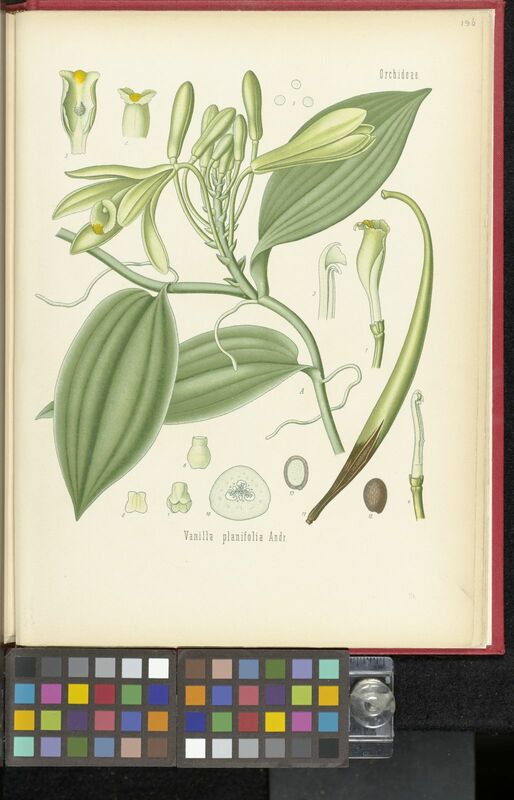 Vanilla planifolia is the source of vanilla, one of the most popular flavours in the world. Vanilla was used by the Aztec people in Mexico to flavour cocoa. Cultivada en Colombia; Alt. 0 - 730 m.; Andes, Llanura del Caribe, Pacífico, Sierra Nevada de Santa Marta. Vanilla planifolia is the source of vanilla, one of the most popular flavours in the world, and weight for weight, one of the most valuable spice crops. 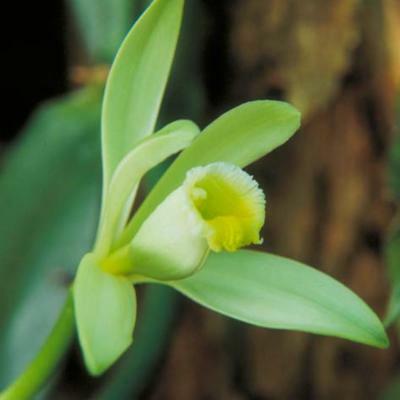 The vanilla orchid Vanilla planifolia grows wild in tropical forests in Central America. It belongs to one of the largest families of flowering plants - the orchids (Orchidaceae). 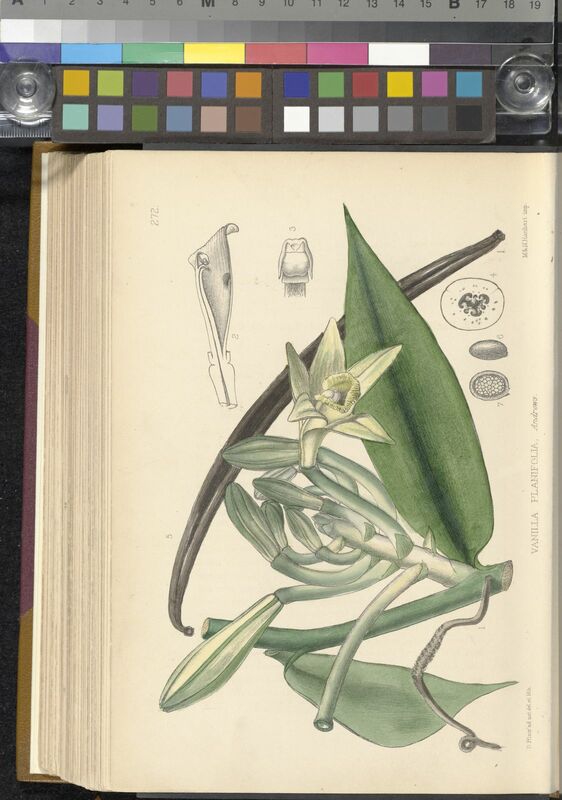 Vanillas (members of the Vanilla genus) are the only orchids that produce an agriculturally valuable crop, and 95% of the world's traded vanilla pods are derived from just one species - V. planifolia. After pollination and fertilization, vanilla pods develop over four weeks and are then harvested, dried and cured to produce the distinctive flavour that we know and love. The pods may be used whole, or split and the tiny seeds scraped out, to infuse cream and custard-based sauces. Native to Mexico and Central America. 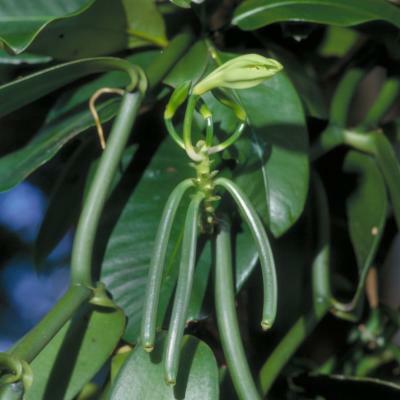 Vanilla planifolia is a tropical vine, which can reach a length of over 30 m. It has thick, fleshy stems and greenish flowers that open early in the morning and are pollinated by bees. The flowers have only a slight scent, with no element of the vanilla flavour or aroma. Once pollinated, the ovaries swell and develop into fruits called 'pods' similar to long, thin runner beans over a period of four weeks. The pods contain thousands of tiny black seeds. The cured fruits ('pods') of the vanilla vine are the source of one of the world's most popular flavourings and are a valuable commodity.The earliest documented use of vanilla refers to its use in a drink made from cocoa beans ( Theobroma cacao ) by the Aztecs. Vanilla was subsequently introduced to Europe by the Spanish in the 16th century and to Madagascar by the French in the 19th century. Today, most of the world's vanilla is produced in Madagascar, Réunion and the Comoro Islands, as well as in Indonesia and Mexico. The tiny seeds, whole fruit, powder or fruit extract of vanilla are used as flavouring agents in food, particularly in confectionery and sweet foods, sometimes to reduce the amount of sugar necessary to sweeten food. It is also among the most important ingredients in perfumery. Vanilla is used medicinally as an aphrodisiac, as a stimulant, and to relieve fevers and gastric complaints, although there is no scientific evidence for its effectiveness in these cases. However, research has shown that vanillin, the main flavour molecule in vanilla, does have antimicrobial and antioxidant activities. The mature, unripe fruits have no flavour when they are harvested. The aroma and flavour of vanilla are released when the fruit is dried and cured by steaming and fermentation. The finest quality vanilla pods turn dark brown and accumulate a frosting of glucose and vanillin on the surface during fermentation. 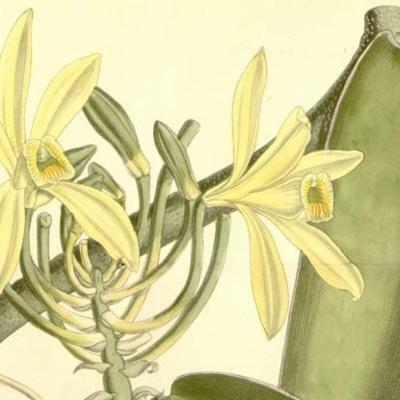 Vanillin was first synthesised in 1874 from a compound extracted from pine bark, and then in 1891 from a different compound extracted from cloves, and is widely used as a synthetic substitute for natural vanilla. The 'vanilla essence' commonly used today is synthesised from wood pulp as a by-product of paper-making and from coal-tar (toluene). However, the characteristic aroma and flavour of natural vanilla comprises a cocktail of over 200 different molecules. 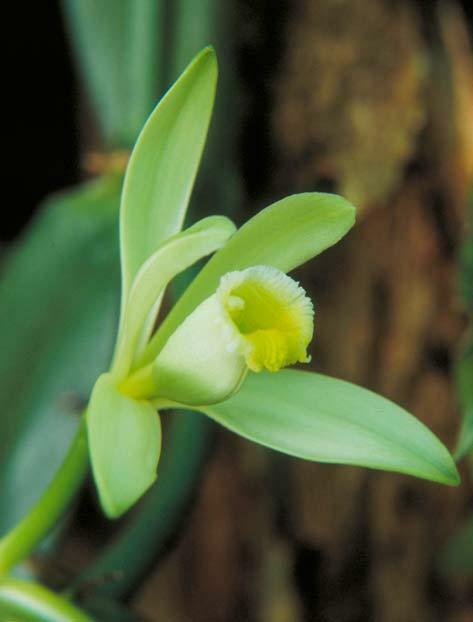 Vanilla may cause allergic responses when applied topically or taken internally. 'Vanillism' is a condition sometimes experienced by workers handling vanilla, the symptoms of which are headache, dermatitis and insomnia. Chris Ryan of Kew's Tropical Nursery has found that propagation of this orchid is relatively straightforward and is usually done from stem cuttings. A piece of stem is taken, with a minimum of three sets of leaves. The cutting is placed on sphagnum moss and kept damp in a warm and humid environment until new growth starts from one of the nodes. The cuttings are then planted into hanging baskets, using a compost mix made of three parts bark chips, two parts pumice and one part charcoal. The compost is watered only when it dries out, but the aerial roots are misted once a day. The plants are kept in a warm zone of the nursery, with a minimum winter temperature of 18˚C, and shaded when necessary. When the plants become large they require some support due to their climbing habit. Flowering can be induced by tip-pruning established plants, which promotes flowering on lateral shoots. 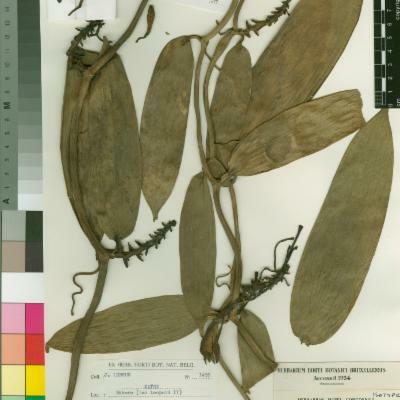 There are 20 specimens of Vanilla planifolia in the Economic Botany Collection, one of the behind-the-scenes areas of Kew. These include samples of pods and vanillin. These items are made available to bona fide researchers from around the world by appointment. 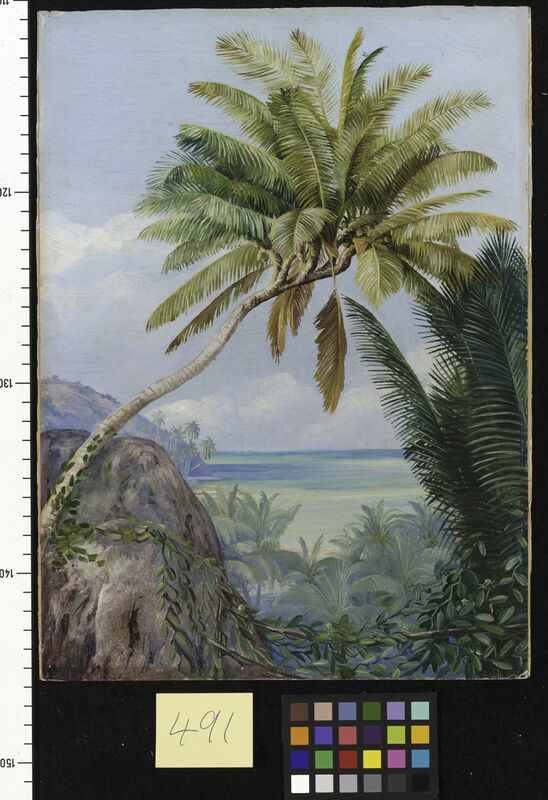 To view a selection of this collection and to discover more about vanilla, visit the Plants+People exhibition in Museum No. 1. 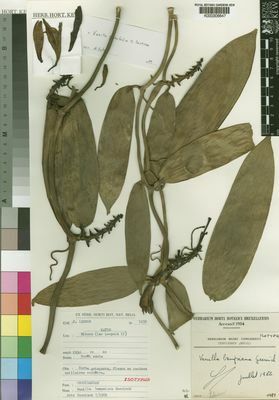 The Herbarium at Kew contains both dried and alcohol-preserved specimens of Vanilla planifolia . The details of some of these, including one image, can be viewed online in the Herbarium Catalogue. The vanilla orchid in the Palm House at Kew flowers every year and is hand-pollinated in order to produce pods. Vanilla vines have been catalogued in Kew's Living Collection since the 18th century and were among the plants at Kew illustrated by Franz Bauer, commissioned by Sir Joseph Banks when he was unofficial Director of Kew. Not assessed according to IUCN Red List criteria, but not known to be endangered in the wild. In rare cases, vanilla can cause allergic reactions when eaten or applied to the skin. As a flavouring agent; in perfumery; in medicines. Noguera-Savelli, E. & Cetzal-Ix, W. (2014). Revisión e integración del conocimiento de las Orchidaceae de Tabasco, México Botanical Sciences 92: 519-540. Cribb, P.J. & Whistler, W.A. (2011). The Orchids of Tonga, Niue, and the Cook islands Lankesteriana 11: 96-177. Soto Arenas, M.A. & Cribb, P. (2010). 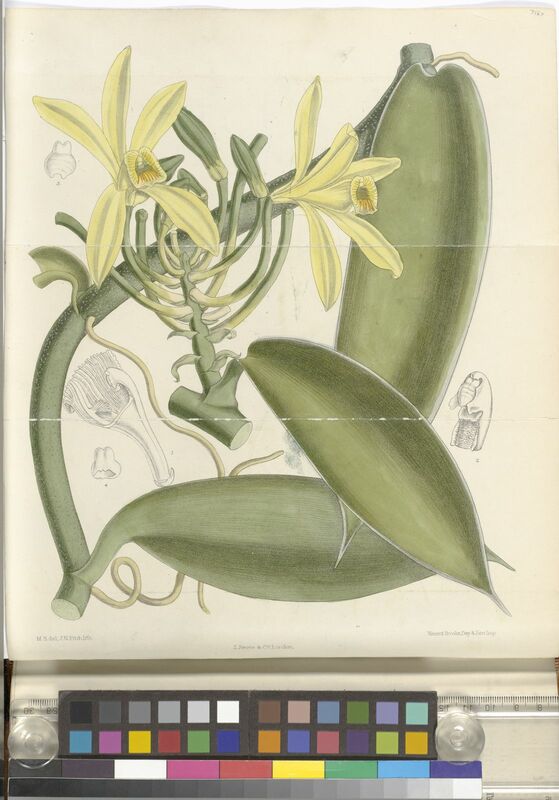 A new infrageneric classification and synopsis of the genus Vanilla Plum. ex Mill. (Orchidaceae: Vanillinae) Lankesteriana 9: 355-398. Soto Arenas, M.A. & Dressler, R.L. (2010). A revision of the Mexican and Central American species of Vanilla Plumier ex Miller with a characterization of their ITS region of the nuclear ribosomal DNA Lankesteriana 9: 283-354. Bernet, P. (2010). Orchidées de la Réunion: 1-368. Naturae Amici éditions. Margonska, H.B. & Szlachetko, D.L. (2010). 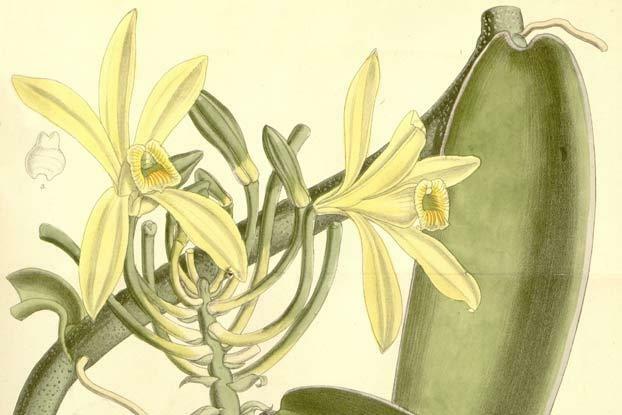 Orchidaceae of Tahiti, French Polynesia: 1-139. Gdansk University Press. Azeez, S. (2008). Vanilla. In: Chemistry of Spices. V.A. Parthasarathy, B. Chempakam & T.J. Zachariah, pp. 287-311. CAB International, Wallingford. Bory, S. et al (2008). 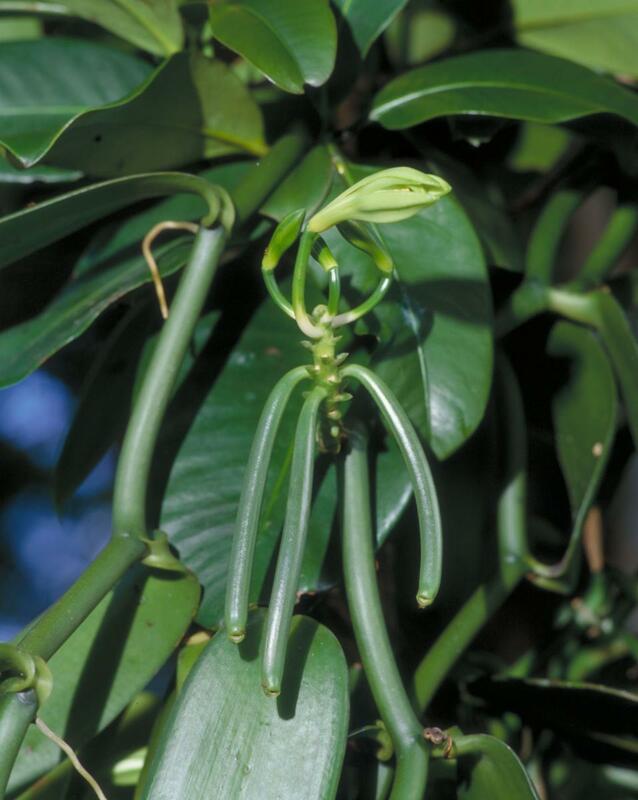 Patterns of introduction and diversification of Vanilla planifolia (Orchidaceae) in Reunion Island (Indian Ocean). Am. J. Bot. 95: 805-815. Jellin, J. M., Gregory, P. J. et al. (2008). Pharmacist's Letter/Prescriber's Letter Natural Medicines Comprehensive Database. 10th Ed. Therapeutic Research Faculty, Stockton. Sinha, A. K., Sharma, U. K. & Sharma, N. (2007). A comprehensive review on vanilla flavor: extraction, isolation and quantification of vanillin and other constituents. Int. J. Food Sci. Nutr. 59: 299-326. Davidson, A. (2006). The Oxford Companion to Food. 2nd Ed. Oxford University Press, Oxford. Mabberley, D. J. (2006). Mabberley’s Plant-book: a Portable Dictionary of Plants, their Classification and Uses, 3rd Edition. Cambridge University Press, Cambridge. Ecott, T. (2004). Vanilla: Travels in Search of the Luscious Substance. Penguin, London.